The extraordinarily gifted and chronically underpaid Georgia Straight illustrator, cartoonist and comic book artist Rand Holmes of Lasqueti Island died at age 60 in 2002. 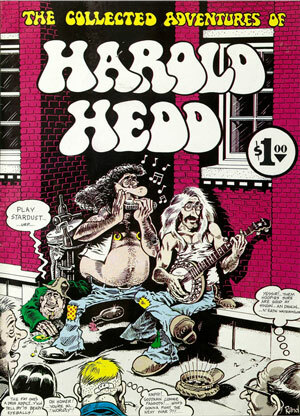 His Harold Hedd comics are collectors' items and he was respected across North America in the Sixties and Seventies as a peer of cartoonist Robert Crumb (Mr Natural) and Gilbert Shelton (Furry Freak Brothers). Cannabis Culture magazine ran a profile on Holmes and his art show that was exhibited on Lasqueti Island in March of 2007. Patrick Rosenkranz of Portland, Oregon, has compiled a 328-page biography and a retrospective art book devoted to Holmes'career, The Artist Himself: A Rand Holmes Retrospective (Fantagraphics Books $39.99 U.S.). Checklist of Rand Holmes Published Comic Work (separate from his extensive work for the Georgia Straight, Vancouver Free Press and Vancouver Star).